Yoono, the Firefox and IE link suggestion plugin, recently added blog and article suggestions to their product. The new suggestions have been added to the top of Yoono’s sidebar and show stories related to the page you’re currently viewing. 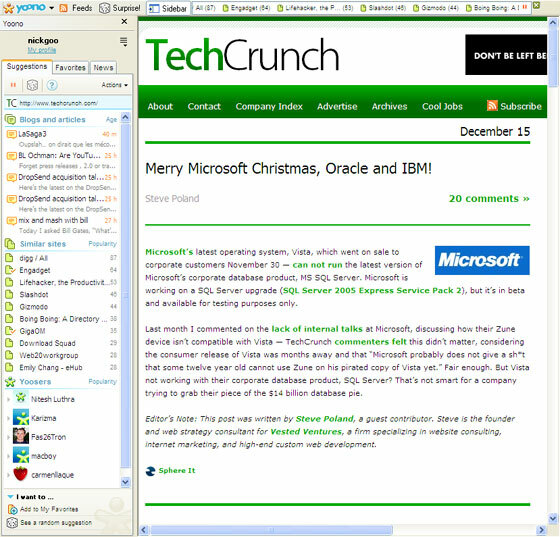 For instance, a trip to Techcrunch yields the results pictured to the right. Yoono is sort of like Del.icio.us and StumbleUpon combined. Instead of staggering around the internet or searching through tagged links, Yoono gives you a list of suggestions in their sidebar or ticker based on what page you are actively surfing. It doesn’t maintain your surfing history. 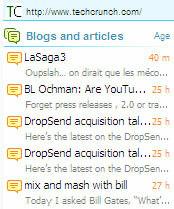 Suggestions are generated based on an analysis of the bookmarks and live bookmarks (RSS feeds) shared by their over 140,000 users. By looking at the bookmarks users share in common and how they are organized by folders, Yoono finds related links. Each of those links is then given a popularity score based in part on the number of users sharing that page as a bookmark. Last month they were serving up over six million suggestions per day. I find the new feature a useful addition the Yoono and actually got drawn into following along the thread of suggested blog articles covering Bill Gate’s most recent appearance. However, the service still needs some tweaking. Every once in a while I get suggestions in languages I can’t read or repeats of stories from blogs containing multiple overlapping feeds. The new suggestions do fill a gap in the product by providing more frequently changing suggestions for each site. The community’s bookmarks just don’t change frequently enough to create new suggestions for pages I visit frequently. Yoono has also been toying with another idea to solve this problem, short-term bookmarks that clean up after themselves by expiring after a given time period. For more on article suggestions, check out SphereIt.